ANONYMOUS: Hey Robert, what are you doing? ME: Just working on what I’m going to say for baby dedications tomorrow. ANONYMOUS: You want to go shopping? My first thought is of Liam. His childlike faith challenged and inspired me. His simple prayers of asking for a new van, one that had a dvd player, had me wondering why I wouldn’t/couldn’t pray for bigger things. I thought I was doing the “sensible” thing with my prayers. I was asking for something “sensible”, at first, with my minivan expectations. Was I being sensible, or was I afraid? Did I lack faith God couldn’t provide something bigger? Did I try and make sure I wouldn’t be disappointed, so I prayed “small”? Liam’s faith inspired me. He got Duncan praying as well for big things with the minivan. What was I to do? There were a number of options I could have chosen, but I looked to God as a dad. I looked at myself and how I would do anything (within reason, obviously) to provide my boys with the best. Liam wants a discontinued Boba Fett LEGO set? I track it down online for him, as he starts to save up for it. He believes he can get it somehow, and later on we manage to purchase it after I find one online. Is God any different? The Bible says no. In my mind I know this. Practically walking it out was a test of faith for me because I’ve been trained to think and pray small with God over the years. We’re never suppose to “mature” in our childlike faith. I thought I was showing maturity by being sensible in my prayer requests for the minivan. I was trying to be the adult. Jesus tells us to be humble like a child, to receive him, and the Kingdom, like a child. The son showed his father what it meant to have childlike faith again. It was unnerving for me to pray boldly for a minivan that went beyond my sensible expectations. It was hard to speak the words, but it was faith-building for me. It was good for my own spiritual “maturity”. Another thought I have with this is God asking me to write the blog post I did a month ago. I wrote about my family’s need for a new vehicle. I shared how we wanted a new minivan. (New being relative.) The process with writing the post was mentally arduous because I was aware what some of the feedback would be. For the most part, people were positive. A number of people prayed for us, and others offered up their own suggestions and tips. Jana and I were grateful for the outpouring of support and love. A number of friendships strengthened because of this. One friend, Jason Hackel, was driving around to different dealerships trying to help me find the right minivan. He was doing this own his own accord. Hearing stories like that blessed me. A handful of people were slightly critical of the post, and they let me know it. I’m sure there were others that disagreed with the premise. I knew that would happen when posting it. I would look foolish to them. It was another part of faith for me, trusting God to provide when people think I’m being idiotic for doing so. I was publicly displaying my faith in a way not often considered a public display of faith. Some thought it wrong of me to want the minivan I did. It’s not like I was clamoring to live the 80’s televangelist’s lifestyle. Nothing close to that. I just wanted a minivan my family could rely on for the next ten years. Another thought? Over the past few months there has been an individual/individuals repeatedly in my thoughts when thinking and praying for a minivan. I thought I should talk to them about the minivan, but I never did. I didn’t want to jeopardize the burgeoning friendship. When they called me a few weeks ago and asked if I wanted to go shopping, my heart rate quickened. A few nights previous to the call, I prayed earnestly. I voiced my frustrations, and doubts, to God. I wasn’t sure what else to do or say. I wasn’t sure how to proceed. I was getting ready to drive almost 2,000 miles with a 20-year old car. The car had no air conditioning, and we are in the midst of a horrendous heat wave. I’m driving my family cross country in that? More importantly, Liam had prayed confidently for the minivan. I wanted to see his prayers answered, and for his faith to be rewarded. Does God always answer our prayers? I believe so, but just not in the way we think. I look back on some big things I asked God for that didn’t happen. I now know why that is the case, but in the moment it can seem like God does not care. After having my “earnest prayer”, I had a sense of peace. I had confidence in God. I had no idea what was going to happen, but was confident in him regardless. Two days later, I spent $200 on getting my car fixed up a bit so I could make the drive to Ohio. I trusted God would provide at some point for a new vehicle. I had hoped it would be before I made the trip to Ohio, but it looked like it wasn’t going to happen. And then the phone call on Saturday afternoon. In the time between the call, and when the individual/individuals came to pick me up, I paced my living room. I tried to not get my expectations up, but also thinking it wasn’t coincidence they were calling me to go “shopping”. I prayed. I wondered. I hoped. I told myself to not be afraid to be bold. How does one respond to that? How does one say “thank you”? I had no idea. My mind was flooded with varying thoughts. God’s faithfulness was prevalent. I thought of God working in spite of me, since this individual/individuals had been on my mind before and I didn’t talk to them. *The individual/individuals have asked to remain anonymous. Please don’t badger me about who it is. I won’t respond in any way to the question. Now, some could say this isn’t God providing, but rather it’s a Good Samaritan doing an incredibly nice deed. You could choose that line of thinking. I will not. I see it as God providing through them. It was a wonderful time as we went minivan shopping. It was also educational for me since I’d never purchased a vehicle off the lot before. They had already done some research online for minivans, so when we pulled up to the lot we were informed. I test drove two minivans. “And, we need to make sure it has a dvd player because his son prayed for one.” We smiled when that was shared with the salesperson. We landed on a 2010 Chrysler Town & Country, with 29,000 miles. It was a smooth ride, had all the amenities I could have hoped for, and the interior was laid out well for my family. They also purchases a bumper-to-bumper extended warranty, and an oil change package, that reduces my future expenses as well with the minivan. The afternoon and evening were a blur. I drove home and parked the minivan in the garage. My hope was to surprise Jana and the boys. They were already out in Ohio, and I was going to join them in a few days. I didn’t want anyone to know I had it. I sat on my porch and tried to process everything. People in the neighborhood were still firing off fireworks, because you know it’s July 7. I enjoyed the show and thought about God’s faithfulness. God is faithful. He always had been. It’s been a two year process. He helped me get out of debt. He inspired me, through people like Joshua Becker, to be more effective with my finances and resources. He helped me all along. He provided when little things came up that took bites out of the savings we were starting. When I was in bed, I was praying. I was thanking God. I started crying, inexplicably, when thinking of people who thought I was foolish with my faith. God had my back. I didn’t look the fool. The best part was when I was crying I was covering my eyes. I’m in the dark of my bedroom. Who is going to see me? I managed to keep the minivan a secret until I drove out to Ohio. Jana didn’t have any idea until I drove up and she saw the in-transit sticker. “Is this ours? !” The boys were ecstatic, picked out their seats, and asked to watch something on the tv’s right away. Later, I told Liam how God provided us with a van. His response? “Well, we should thank God!” I was proud, and humbled. I asked Liam to pray. “God, thank you for giving us a new minivan with tv’s and air conditioning. Amen.” Amen. I almost started crying again. We broke in the minivan on the trip. The boys made sure of that with spilling food and drinks, tracking in dirt, and leaving crayons in the cup holders where they’d melt. It brings a smile to my face. We put 1,940 miles on it over vacation. The air conditioning was great when the temperature read 102 degrees. The long drives from Ohio went faster, for the boys, when they could watch The Empire Strikes Back. I’ve learned a lot over the past two years. It’s been an experience. Looking back on it, I wouldn’t change a thing. So awsome! I am so happy for you all…God is good! Amazing! This post blessed me incredibly. God just gets better and better the longer I know him. I am so pumped for you are your family. My wife will love this post. Thanks for sharing Robert. 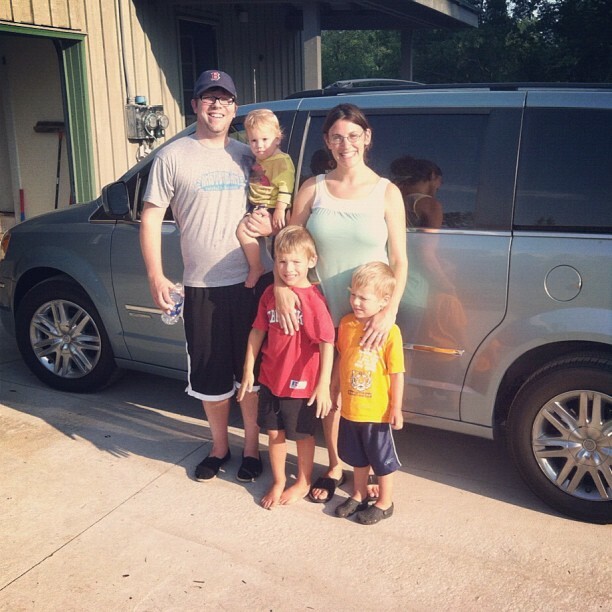 I pray blessings on the family that obeyed God and bought the van. Praise the Father, Son and Spirit!! !